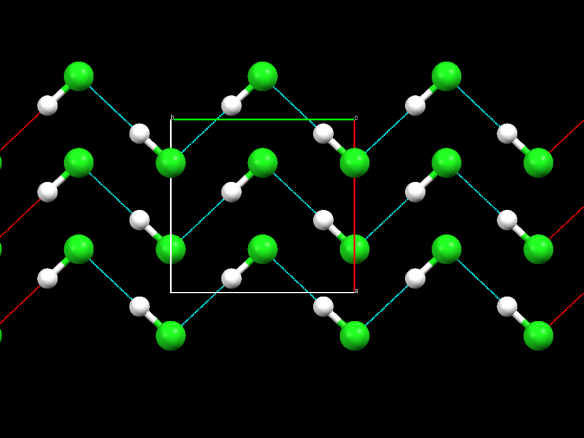 This blog about stomach acid shows this image of the "zig-zag" form of crystalline HCl (see also Wikipedia where it looks (to me) like five four HCl's per unit cell), but links to this cubic crystal structure (2nd image) data card instead with only one HCl/cell. 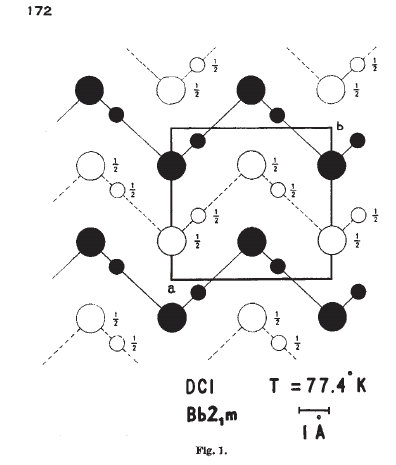 I've read crystallographic "data cards" in a past life, but I have no idea how to search for all the forms of HCl on-line (and non-paywalled) now, in order to get the lattice constants, angles, unit cells etc. 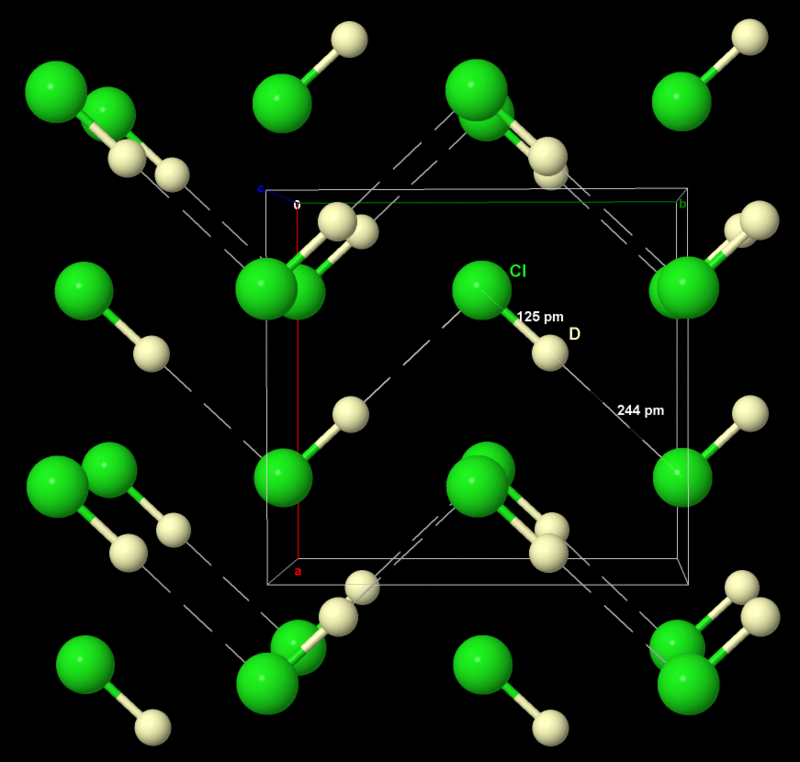 to build a 3D model of each form of crystalline HCl in Blender for example. 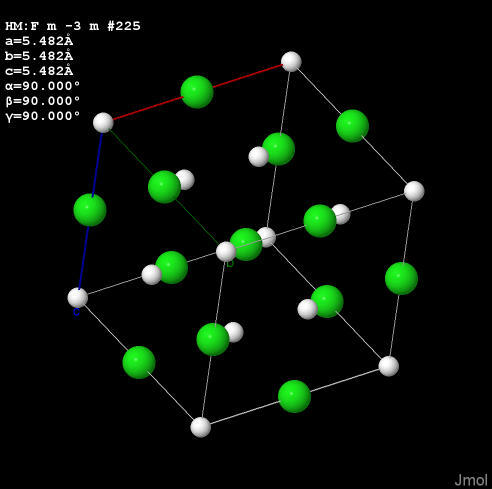 note: I am really looking for just the dimensions and shape of the unit cell, and coordinates of the atoms within the unit cell as a name and numbers, as one would find on a crystallographic data card. I can do all the plotting - no need for plotting software. below: Here's the Wikipedia image mentioned above, from here. 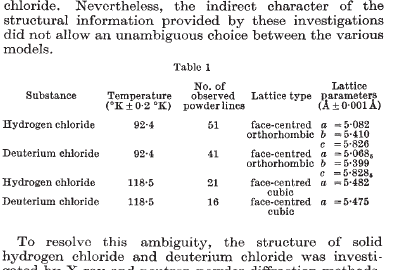 It certainly looks like the Chlorines are at 0.25 and 0.75 along the a-axis (vertically) and 0.00 and 0.50 along the b- and c-axes, so there seems to be enough information here to work out or infer the complete 3D structure, assuming it's cubic, and further infer that a=b=c=521pm, which suggests a density of this solid of about 1.7 g/cm^3. But remember, when you infer, you make an inf out of e and r.
From the first picture depicted, I would refrain from stating there are five HCl molecules per unit cell. One thing, while there is some choice in the definition of a unitcell (there are several definitions possible, even under the constrain "it should be the simplest and still complete representation possible"), lower multiplicities occur more often; and more frequently seen values are $Z = 1, 2, 4$. Second remark, again to the first picture: no, it does not look so as there were five molecules per unit cell. 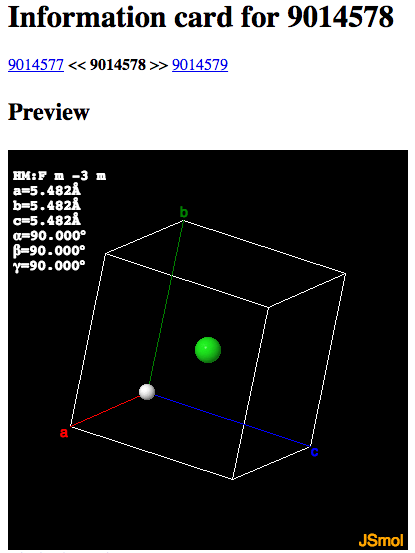 Here, the projection of the $(a,b)$-plane is depicted (the little green and red axis emerging the origin O bear a label). To graphically determine the actual multiplicity or the number of molecules present in a unit cell, it is better to "walk around" the unit cell; for example by accessing either *.cif (typical for small molecule structures) or *.pdb (more typical for protein structures) in a appropriate program, like CCDC's Mercury (likely used in the first drawing), or Jmol (used for the second drawing), or Avogadro. Each of the three programs may be deployed under Windows, Linux, or MacIntosh; and in terms of displaying structures and to perform measurements of distances and angles available for free (as free beer). It is possible, yet not in every case necessary to go from *.pdb or *.cif via Blender to prepare a dataset for 3D print though. The "just do it" software that comes to my mind for this purpose is Werner Kaminsky's cif2vrml (windows only). If you have Mercury (which actually may read both *.pdb, *.cif, beside *.mol, *.mol2, *.xyz, too), there is a built-in file -> print 3D menu, too; allowing you to chose between *.vrml or (then colourless) *.stl file. Doing so found entry in publications, where examples in the Journal of Chemical Education like DOI: 10.1021/acs.jchemed.5b00597 and DOI: 10.1021/acs.jchemed.6b00293 come pretty close to what you intend to do. (As you are not afraid of larger molecules, consider the dedicated NIH 3D exchange as a valuable source of inspiration, too.) Both jmol as well as Avogadro (referring to 1.2.0; not to the branch of Avogadro2) equally offer VRML export, the former including a dedicated how-to here. Where to get the *.cif? Literature databases like ACS' Scifinder and Elsevier's Reaxys indicate / link to such primary literature. Depending on the journals policy, these *.cif data may be freely available in the SI (ACS journals, for example), or not (Tetrahedron family ...). Clearly, a dedicated database ones like CSD (organic, metalorganic; preferentially small molecules than proteins) is an option. For the service and potential insight offered, an annual academic subscription is very well invested money (was once around US$ 300-400 per year and full time equivalent). If you encounter their structure code in a literature reference, but not the *.cif, you may request the data free of charge here; regardless if you / your institution holds a subscription, or not. For mineral compounds, for example ISCD or the one by AMS. The baltic COD is much younger than the others (CSD started more than 50 years ago), so the data coverage is not yet this complete, but searchable by keyword and structure, too; yielding by the former (allowing only H and Cl as the only elements present) 5 entries for HCl. Where to find all the *.cif of HCl? It is not really organic / metallorganic (CSD), nor really a mineral (ISCD). Perhaps via Scifinder and Reaxys one may retrieve a more round answer. From these two it may be possible to construct (manually) a *.cif file which is then readable to Mercury others. For this nature paper, Thomson Reuter's Web of Science alone knows about 139 citations, the most recent one in 2015 10.1021/acs.jpcc.5b01653 about predicted supraconducting polymorphs of HCl and HBr in the monoclinic $C2/m$. 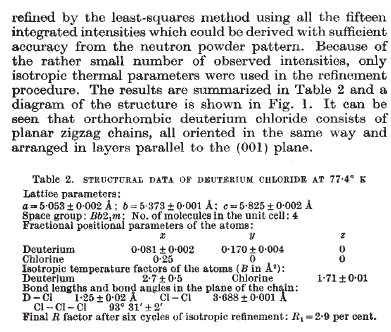 Furthermore, a cif file based the Italian 1933 structure report the English wikipedia refers to is accessible in the COD if searching by keyword (H and Cl elements present, excluding O and C, minimal = maximal number of elements = 2). Not the answer you're looking for? Browse other questions tagged inorganic-chemistry crystal-structure crystallography or ask your own question. How to visualize a crystal from a unit cell PDB and how to draw the unit cell's axes?